Add Your Business Card Magnets - Your business card sticks on top! 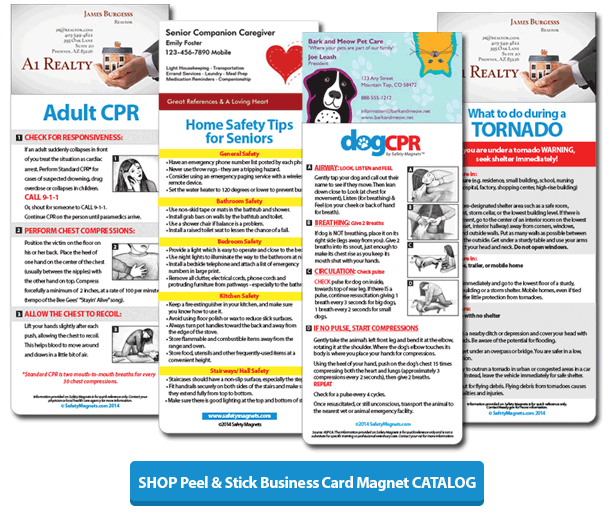 With over 20 health and safety topics to choose from, our Add Your Business Card Magnets are a great idea for brand building, increasing recognition, customer retention and educating and direct mail (fits in #10 envelope). Don't see the topic you want? Let us know, we'll design what you need - usually at no extra cost! First aid and other life saving information in an emergency - right at your fingertips on the refrigerator, medicine cabinet, or filing cabinet rather than lost in a drawer. Clear, easy directions with step by step illustrations to aid during an emergency. Unlike seasonal magnets, Safety Magnets are timeless and not likely to be thrown away. Versatility - use for sales calls and prospecting. Simply peel off the protective adhesive liner, add your business card, and you now have your own customized Safety Magnet!